Stitcher, which provides on-demand podcast streaming to desktops and mobile devices, has overhauled the look of its iphone and and iPad apps, changing the dominant color from royal blue to dark gray, replacing the logo's rounded lowercase letters with blocky all-caps, and making images accompanying podcasts larger. Chuck Harris, Stitcher senior designer, wrote on the company blog that, "The logo had to have a narrative that told the Stitcher story and gave listeners a hint at what was to come. We wanted the logo to “do a lot of work." The App Store description says version 4.5.0 also makes it easier to create custom stations -- a feature change largely driven by customer feedback -- fixes bugs and gives app users estimates of when Stitcher will be back up during "server maintenance windows" (hmmm). This version has been tested and will work with iOS 5. For more background on Stitcher, see our profile. Podcasts you've favorited appear in a separate list. When you tap on a podcast, the latest episode immediately starts playing. You can give the episode a thumbs up or down, favorite it, bookmark it and of course share it on Facebook, Twitter and by email. Scroll through the list of recent episodes in the bottom third. The iPhone version of the "front page" only offers top stories, not the same range of content as the iPad app front page shown above. When you launch the iPhone app, you get a menu rather than the "front page" listing -- to which you can navigate from here. 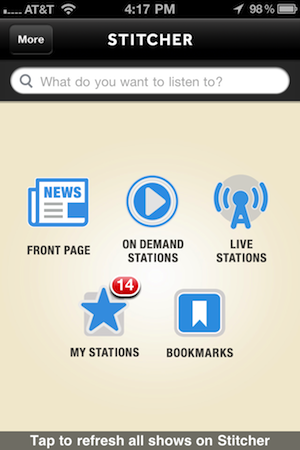 Your on-demand stations include anything you've starred. Click on a podcast to start playing it. This set up has not changed, but the bottom bar stands out more now that's in dark rather than light gray.